Ho ho ho! Have we been naughty? Have we been nice? How about a bit of both! The three new enemies we recently introduced now have their own set of naughty abilities! We think this adds a lot more variety to the tactical combat, especially in the later missions where you may find strategies you used early in the campaign need a rethink as a result. When a Phantom takes damage, they will vanish in a puff of smoke. Until they re-appear, they won’t be targettable or able to take damage. Spectres sprint around chasing their prey, but when they get impatient of all that running have the ability to teleport closer to where they want to go. They will also teleport away when they take damage. Whenever they do this, Kai gets a strange tingling feeling - it’s like they’ve rewound him. Very unsettling. he absolutely will not stop, ever, until you are dead. The Nemesis has a single focus: you. He will walk through walls to get to you. He cannot be stunned. He cannot take cover. And he cannot be manipulated - at least, not with any of your time manipulation abilities. Some human enemies will now patrol, both inside and outside of the club. 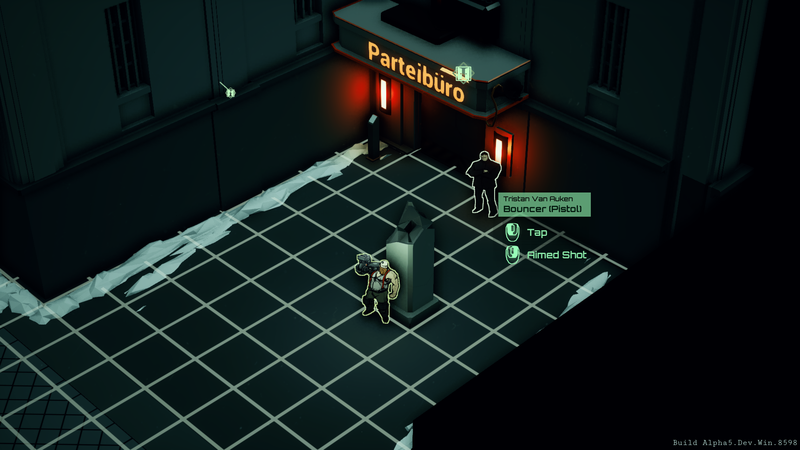 They also display the tiles on which they will be alerted to the player. A new weapon that you can take on missions, the Persuador is a short-range spray of something very, very nice. So nice, in fact, that humans will be very enamoured by you if you spray it in their faces. They’ll fight alongside you for the duration of the mission, as well as help you out if they’re guarding a door, for example. But use carefully: it can’t be reloaded, so make every spray count. Upgrades provide additional uses. The upgraded Cyber Fist now causes cascading damage when used on walls. At Mk3, five tiles of wall will be destroyed with one smash! Clubs now have a new room type, the Courtyard, which is an area that is actually outside. These change the footprint of the building to make for more interesting layouts, and can also be in front of the front or back entrance. Note this features is still a work in progress - we hope to add more variety to both the courtyards themselves and club layouts in a future update! To make hacking more of a meaningful decision, the Time Resource cost of hacking objects in the game now reduces your maximum Time Resource for that mission. Thanks to our Kickstarter backers, we’ve added collectible IDs into the game! These can be find in a variety of locations, and feature the good people who made it all possible. You can view your collection from the main menu: collect them all for an Achievement! For our Kickstarter backers, we’ve started including your in-game rewards, and sending out your digital IDs! For more information, see the Kickstarter update. We’ve also made a number of tuning tweaks and balance changes - see the full change notes here for details. The next update will be coming in January! In the meantime, have a great New Years - and if you go to any seedy nightclubs, play safe!